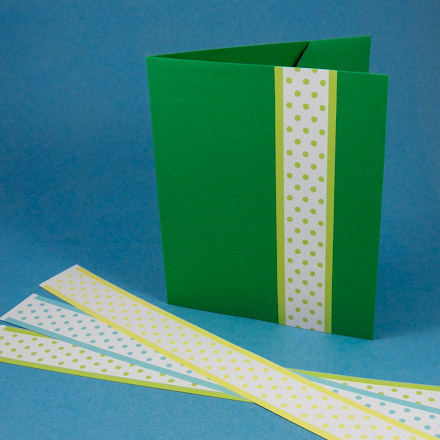 This tutorial shows how to make a pocket folder for storing, packaging and presenting your handmade greeting cards. 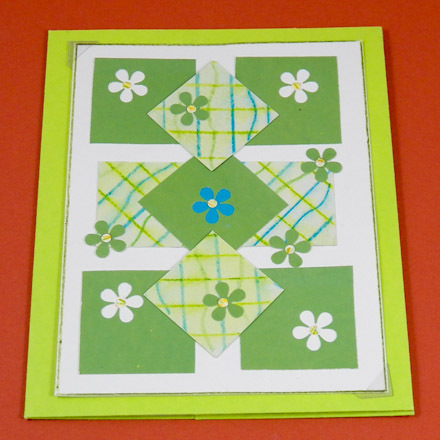 This two-pocket folder made from a single sheet of cardstock (and some scraps) holds four cards (4¼″ by 5½″) and four envelopes. This simple folder is perfect for storing your handmade cards, and with multiple folders, you can arrange the cards by theme or occasion. 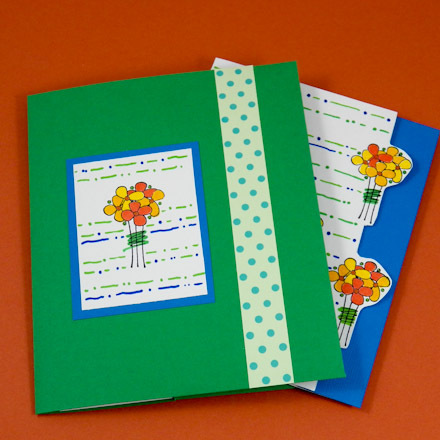 When selling or giving your cards as a set, make a folder to match your handmade cards. All of the greeting cards in the original Greeting Card Class set of tutorials and the Greeting Card Class 2 tutorials fit inside this two-pocket card folder. If you are new to cardmaking, follow along with these tutorials to make a wide assortment of cards and learn cardmaking techniques. Related craft: For another way to store greeting cards, see the Greeting Card Case craft project. 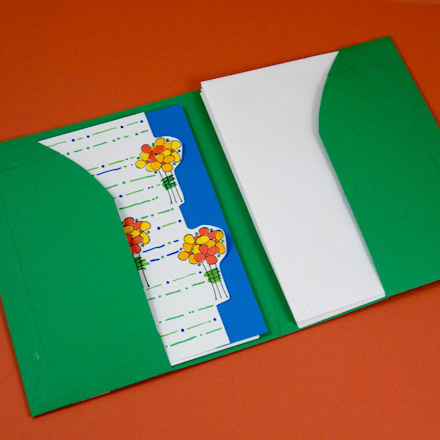 The card folder can be made from white, colored or printed cardstock. 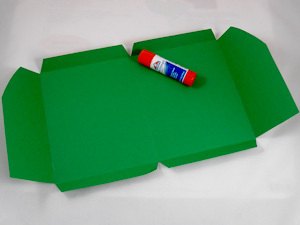 Select a color that best suits the greeting cards which will be stored inside. If you plan to decorate the card folder with rubber stamps, light-colored or white cardstock works best. 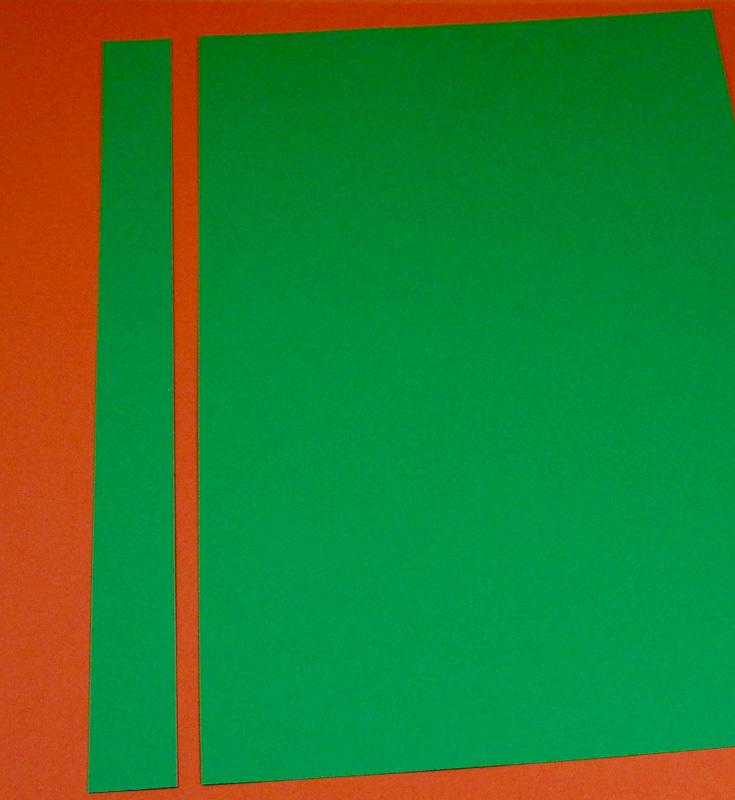 Medium-to-dark colors of cardstock look very nice when decorated with simple strips of coordinating cardstock. 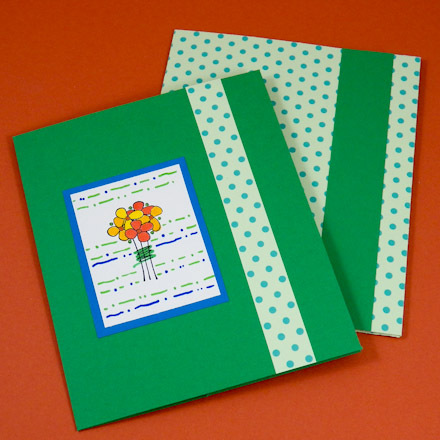 You can make your own patterned cardstock for card folders by printing digital papers, like Aunt Annie's ePapers, onto plain white or colored cardstock. 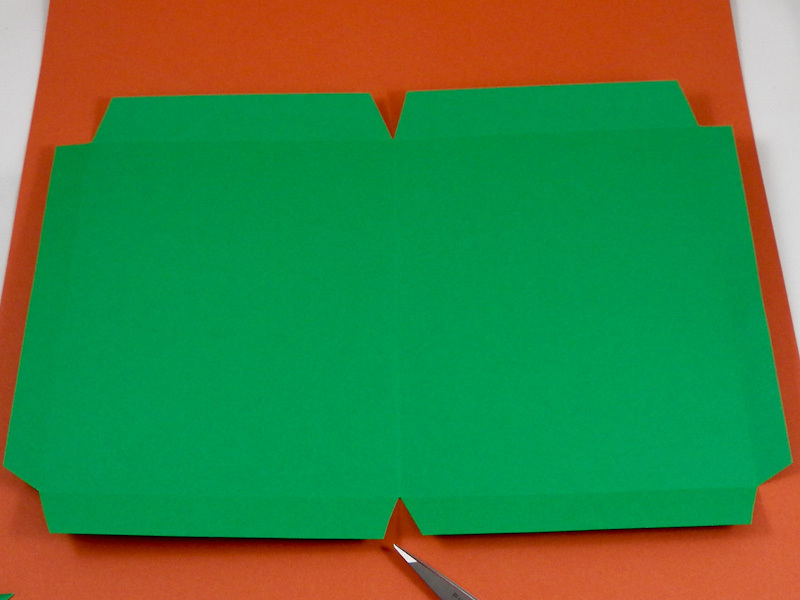 To make the card folder, you will need a 7½" by 11" piece of cardstock and two pocket flaps. Using the craft knife and ruler, cut a 1" strip off the cardstock sheet along one of the long edges. 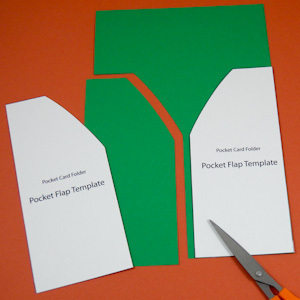 To make the pocket flaps, print the pocket pattern and cut out the pocket flap template. Trace the template twice on scraps of cardstock that match or coordinate with the folder's cardstock. Cut out the pocket flaps. Erase any visible pencil lines. Tip: If you are using patterned or double-sided cardstock, be sure to flip the template over before tracing the second flap, so you that have right- and left-facing pocket flaps. Fold the cardstock in half, matching the short sides, then unfold. 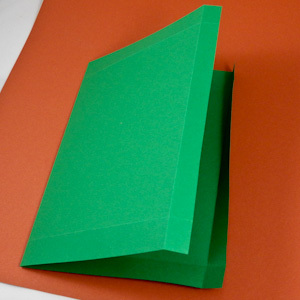 Fold over all four edges of the cardstock: ¾" on the long sides and ½" on the short sides, then unfold. Tip: Before making the folds, score the fold lines by running a bone folder or empty ballpoint pen along the edge of the ruler. Cut away each corner, making cuts on a slight angle that starts just outside of the fold line and ends where the two fold lines meet. 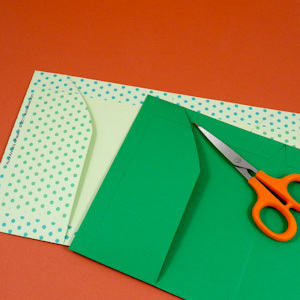 Cut a V-shape away from the middle of the long folded edges at the center fold. 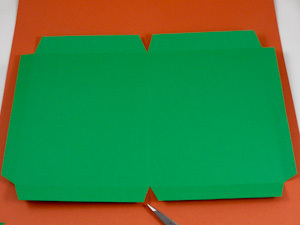 With the card folder and pocket flaps face-down, glue the pocket flaps to the side edge folds. Align the top of the pocket flap with the edge fold, apply glue along the edge fold, and place the pocket flap evenly with the fold. Rub along the edge fold to ensure a secure hold. Tip: Test the top and bottom folds before gluing. If the pocket flap is too long and interferes with the folds, trim a tiny bit off the pocket flap and test again. With both pocket flaps folded over, fold the top and bottom edge folds and glue in place on top of the pocket flaps. Rub to ensure a good hold. Free the pocket tops and bottoms by snipping through the folded edges. After the glue is dry, place cards and envelopes in the pockets of the folder and fold closed. If you like, decorate the front of the card folder. Keep the decorations simple so that they complement the cards. You can use rubber stamps, stencils, paper punches or die cuts. 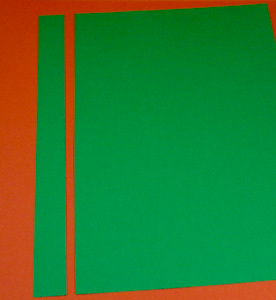 A simple strip of cardstock and/or a matted image are nice additions. Tip: Use these printable paper ribbons to decorate a Pocket Folder. Download and print Aunt Annie's Spring Dots Paper Ribbon ePaper for three colors of polka dot ribbons that coordinate with the Spring Polka Dots ePapers. Tip: Decorate the Pocket Folder with Aunt Annie's Spring Dots Paper Ribbon. Tip: Use the Pink Easter Dots ePapers, or any patterned paper, to make a Pocket Folder. 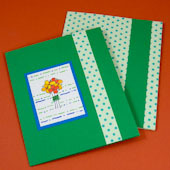 These ePapers coordinate with the Easter Dots ePapers and Pastel Polka Dot ePapers. 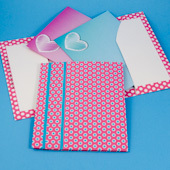 Tip: The Pink Easter Dots ePapers can be used to make a pocket folder for envelopes. 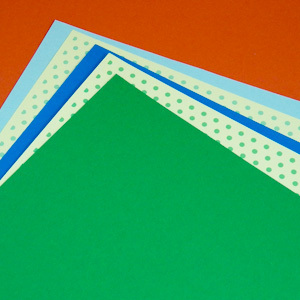 The printable envelope patterns in the Envelopes to Make craft project have similar colors. Cut out the pocket flap templates. Trace the templates on cardstock and cut out. Tip: Instead of tracing the template onto cardstock scraps, the pattern may be printed on the reverse side of cardstock and cut out. Tip: Decorate the Pocket Folder to coordinate with the greeting cards stored inside—like these Cutout Edge Cards. 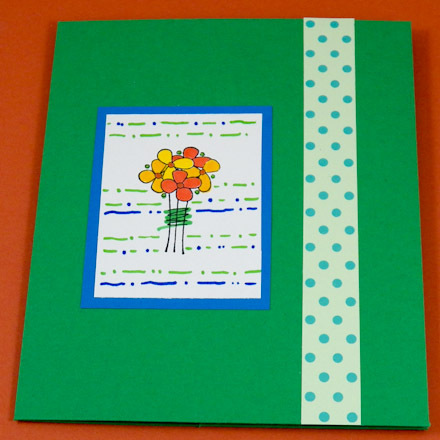 Tip: Use photo-corners to display a greeting card on the front of the Pocket Folder.